Very popular among Great Loop boaters, Mainship's 34 Trawler is a top choice for extended coastal cruising, and makes an exceptional weekender as well. With a semi-displacement hull and full keel, she's considered a "fast trawler", capable of getting up on plane when the need arises or enjoy a leisurely slow cruise when time is not a factor and life is good. The single stateroom interior layout is geared to a cruising couple and provides for a spacious salon area and well equipped stepped-down galley. "Red Rover II" is exceptionally well fitted out with all the traditional cruising amenities plus fully instrumented upper and lower helms and loads of recent upgrades. The enclosed bridge extends aft over a good sized cockpit with transom door access to the swim platform. Bow and stern thrusters provide great maneuverability in tight docking situations and the twin Yanmar diesels are still sitting below 1000 hours with many miles to go. 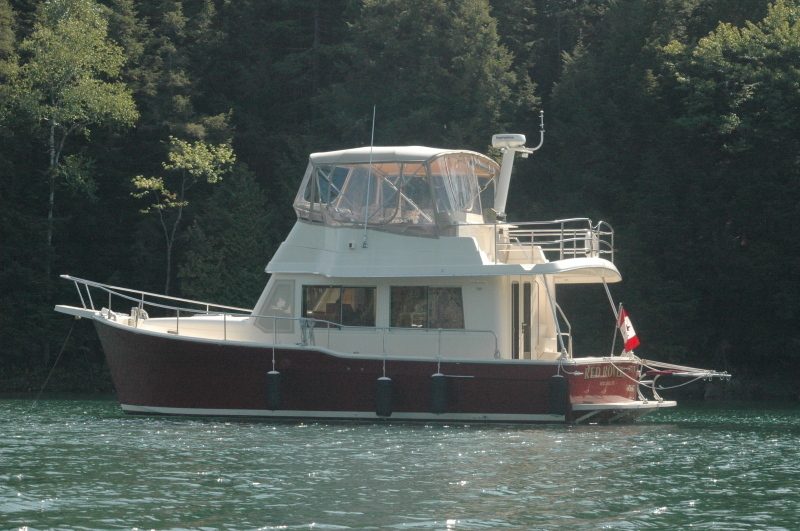 This head-turning, 3-owner, freshwater Mainship is in like-new overall condition and won't sit long on the market. If an extended cruise is high on your bucket list, don't miss out on this one! Inside heated winter storage! Please call ahead to book a viewing appointment.